Offshore China that is. The Pentagon alerted Congress of a proposed $6 billion arms sale to Taiwan, a seemingly independent island state yet still part of the Republic of China. 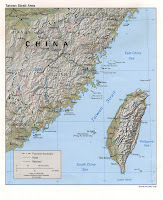 "China aims more than 1,000 ballistic missiles at Taiwan; the U.S. government is bound by law to ensure the island is able to respond to Chinese threats. The package includes 114 Patriot missiles designed to shoot down other missiles, 60 Black Hawk helicopters, and two mine-hunting ships"
Pissin' off China. Hope this turns out okay.